A new arc, a new slim trade paperback format, and a low introductory price make this the perfect opportunity to join the legions of ELEPHANTMEN fans with ELEPHANTMEN 2260, BOOK ONE, written by Richard Starkings and featuring art by Axel Medellin. Jack Farrell is a private detective who never gave a second thought to the Elephantmen—until he was paid to. Read the comic John Layman, writer of the New York Times bestselling CHEW calls, "not just the best science-fiction on the market today, but simply one of the absolute best comics. An epic, affecting, unforgettable exploration of the human condition." 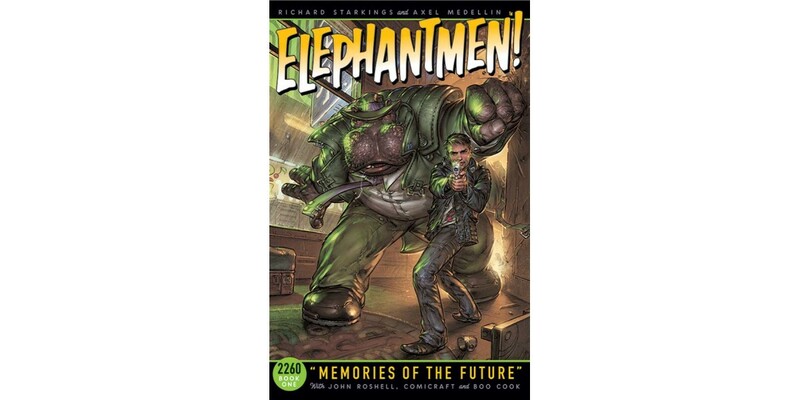 ELEPHANTMEN 2260, BOOK ONE collects issues 51-55. ELEPHANTMEN: 2260 BOOK ONE TP (ISBN: 978-1-60706-960-7), collecting ELEPHANTMEN #51-55, arrives in stores on 4/2 at a low introductory price of $9.99. It can be pre-ordered using Diamond Code FEB140572.